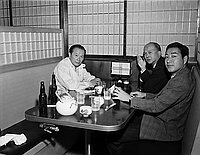 Taro Okamoto drinking with two men in a booth at Kawafuku restaurant in Little Tokyo, Los Angeles, California, May 11, 1968. 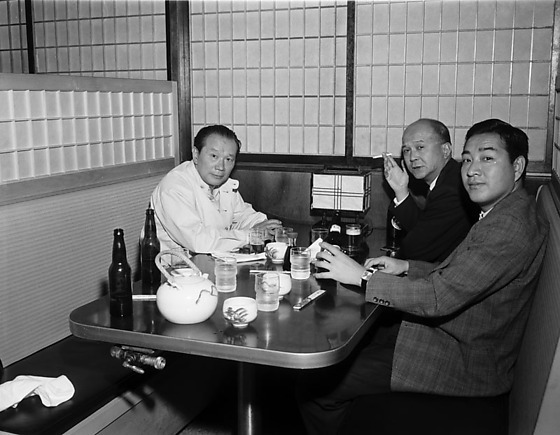 Two men in suits sit at right; man in foreground pours beer as man in back smokes cigarette. Man on left wears a white jacket. All three look at viewer. Glasses, beer bottles, tea cups and tea pot on table. Shoji windows and dividers. Typed on original envelope: Taro Okamoto at Kawafuku.